I am not a learned writer. I get by as I suppose most of us do on an everyday basis, using fairly correct grammar, spelling and punctuation which I learned in grammar school but that's the extent of my educated writing skill. I think I articulate well enough both orally and in writing through the use of words and can make a picture come to mind for the intended audience. At least that's what I've been told. But there are times when a picture isn't needed or a step by step tutorial or a joke being tossed to a friend. It's the in-between type of writing I'm talking about, specifically email writing. I recently sent an email to someone and the intent of what I was trying to say was 100% misunderstood. I re-read my email and couldn't see anything wrong with it. I read the answer I received and it left me with a "huh?" feeling. So what happened? What was missing between us? I've chosen to take the matter with a grain of salt. Sometimes that's the best thing to do when the matter at hand isn't terribly important. As I said, I'm not a learned writer by any means but I think the problem with writing good emails for those of us who are the average email user, lies in the absence of several things, notably lack of face to face dialogue and eye contact. Non-verbal communication information like facial expression, body posture, gestures and voice tone are missing. Without these important cues, our imaginations fill in the blanks of what the email sender intended to say and how the reader received it. I showed my sent email and the reply I received to a close friend and she laughed and said, "Mina, he obviously doesn't know you very well. You're always so soft spoken; you're a softie and everybody knows it. And him, he must be having a bad day." So there you go; my voice tone hadn't come across in such a way as to make my reader comfortable. I do agree that even if one writes in a certain way that 99% of people would correctly receive in the way it was given, that doesn't mean that an email is received in the way it was meant. Maybe the recipient is having a bad day, is in a nasty mood and anything you might say will be interpreted off kilter. Unfortunately, that happens sometimes. We know that writing in all capital letters is perceived as screaming at someone. Personally, I tend to write my emails and send them right away after doing a quick re-read for spelling mistakes. I'm going to try and stop doing that. If there's the slight doubt of perhaps being misunderstood, it is better to craft the email into Drafts, sit on it for a bit before sending, edit it if needed, then send it later. Remember that the sender and receiver may or may not be in the same emotional climate. We all have days when we're cranky and any little thing irks us. Even personal email exchange shouldn't be loaded down with text language, acronyms and emojis. (BTW, OMG, OTOH, CU, etc) They become boring and not everyone understands them. I've used LOL several times recently but I think the word "grin" in parenthesis works just as well. So, ThriftyFun friends. 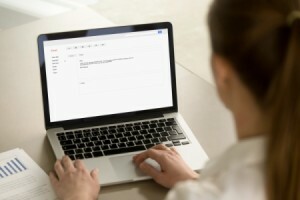 Do you have more email construction tips? I'm all ears and would like to hear them and learn tips from you. I think you write extremely well, and I sure know what you mean...things do get misunderstood in how our type is printed sometimes, because it really can appear differently than how it's meant. It is very difficult to convey emotion via text and email sometimes. And for some people it's even harder to interpret what others mean or how they're saying it. I think you type just fine. I understand you. The one thing that has been bugging me lately is the unprofessional part of emails. I wrote an email to a corporation the other day and the email I was sent back with their reply was like a little kid wrote it. They put u instead of actually typing the whole word you. They used except when the correct word would of been accept. I just don't see why I waste my time making sure what I wrote makes sense and if it's spelt correctly when a corporation can't even send a professionally typed out email. It made me wonder if I even wanted to deal with this company. Anyways, in the end, it just shows their lack of education or they are just plain lazy. When it comes down to not talking to your friends, type the whole word. It's really not going to take you that much longer and it seems well put together. Anyways, your doing just fine! You mean "their" lack of education.